Punto Fa, S.L., trading as MANGO, is a Spanish clothing design and manufacturing company, founded in Barcelona, Catalonia, (Spain) by brothers Isak Andic and Nahman Andic. Mango has Women's, Men's and Kids' collection. Mango has over 16,000 employees, 1,850 of whom work at the Hangar Design Centre and at its Headquarters in Palau Solità i Plegamans (Barcelona). 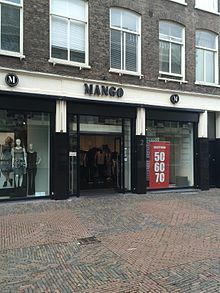 Mango's biggest market is Spain but Istanbul, Turkey, has the largest number of Mango stores. In April 2011, Letizia, Princess of Asturias visited the company headquarters wearing a Mango outfit. In 2015 Mango had revenue of 2.327 billion euros with EBITDA of 170 million euros. In 2010, the French division of Mango got sued by Anne-Cécile Couétil, creator of the brand Velvetine, who argued that Mango copied two models of her handbags. Despite an attempt of protection via the INPI and similarities between her products and the ones of Mango, the creator lost the lawsuit. She was ordered to pay €6,000 to Mango. On her blog, Couétil claimed she wanted to lodge an appeal. Several bloggers were surprised by the judicial decision saying it's unfair. The brand Mango reacted on Facebook via its official fanpage and answered also on the creator's blog. ^ "Zinedine Zidane becomes Mango's latest ambassador". Yahoo News. Yahoo. Retrieved 20 August 2015. ^ Tina Isaac. "Fresh Mango". First Style. Retrieved 1 June 2012. ^ "2015 Annual Results Press Release". ^ Zain Al-Mahmood, Syed (24 April 2013). "Matalan supplier among manufacturers in Bangladesh building collapse". TheGuardian.com. Guardian News and Media. Retrieved 21 October 2013. ^ Nelson, Dean (24 April 2013). "Bangladesh building collapse kills at least 82 in Dhaka". The Telegraph. Telegraph Media Group. Retrieved 24 April 2013. Wikimedia Commons has media related to Mango (clothing).